Tomorrow is Technique Junkies first stamp release for 2019. Be sure to come back for that special day! Today I am sharing 11 favorite cards I have created for this blog since Pat Huntoon has owned Technique Junkies Stamps. Of course, they are all Technique Junkies Stamps. The links for the stamps used will be below the picture. I hope you have enjoyed this look back at these eleven cards. Be sure to come back for tomorrow's Stamp Release Blog! 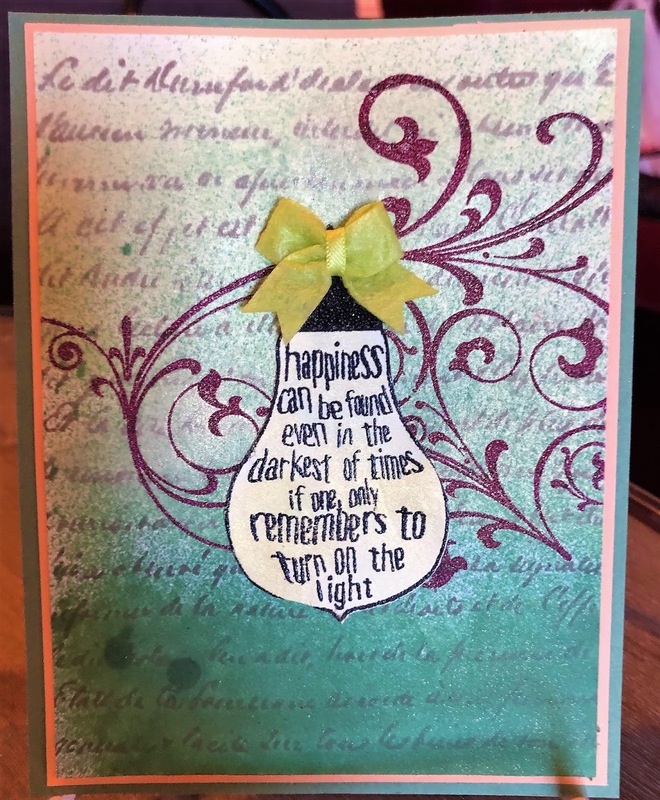 To create this card, I used my very, very dirty Versamark ink pad. I wanted to use the dirty one and not the clean one because I wanted to color my image with Pan Pastels. In order to do that I had to be able to see it! In order to see the stamped image the Versamark pad had to be dirty. 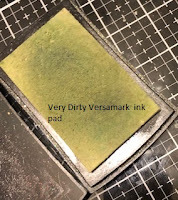 I used a MISTI so I could stamp, restamp, restamp, restamp, and restamp until the image was clear enough for me to use. Because Pan Pastels do not have a skin color I used my Copic markers to color her skin. I used a very thin tip on a writing marker to add some details around the puppy, her face, and her arm. Those details did not show up with the Pan Pastels. 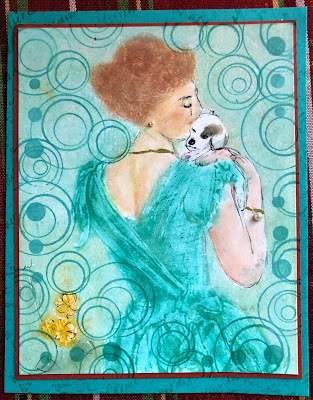 I used a pointed Q-Tip to add the Pan Pastels to background, her hair, her dress, and the spot on the puppy. I stamped randomly on the card base to add texture. 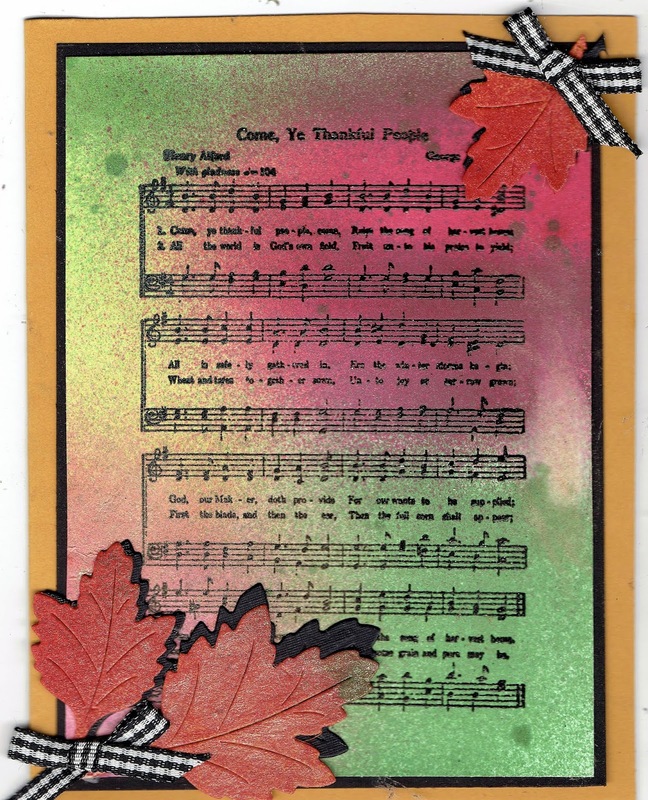 Please look at the Cling Mounted Stamps Mega Clearance Sale on the Technique Junkies Web Store page. And if you can use the unmounted stamps (however you do that) then look at the Unmounted Stamps Mega Clearance Sale page. You will find some great deals! Have a great day, and I hope you have a chance to get inky! It is always strange to me that when you take a picture of a card, it doesn't come out in the right colors. I took several pictures and it still wasn't right! So you will just have to believe me that the upper TJ Shimmering Bliss color is Mindaro and it is Yellow. And the light blue is sprayed heavily with Mindaro! And it IS yellow. And the bow matches it perfectly! The blue is Shimmering Bliss Ocean Depth. The text inside the light bulb is heat embossed in detail black embossing powder. I have been on the Design Team for Technique Junkies for a long time. I was on the Design Team when Pat Huntoon published a newsletter several years ago. 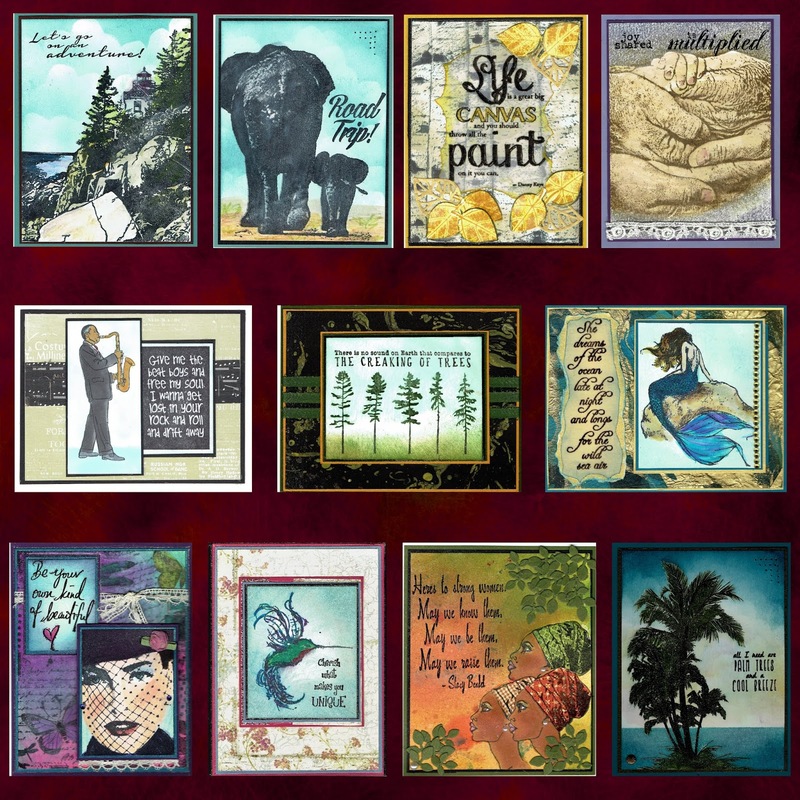 I have been on the Design Team for Technique Junkies Stamps since Pat Huntoon bought the company. And I am still on that Design Team, and I plan to be for as long as she wants me and I can do the work of designing cards for her. 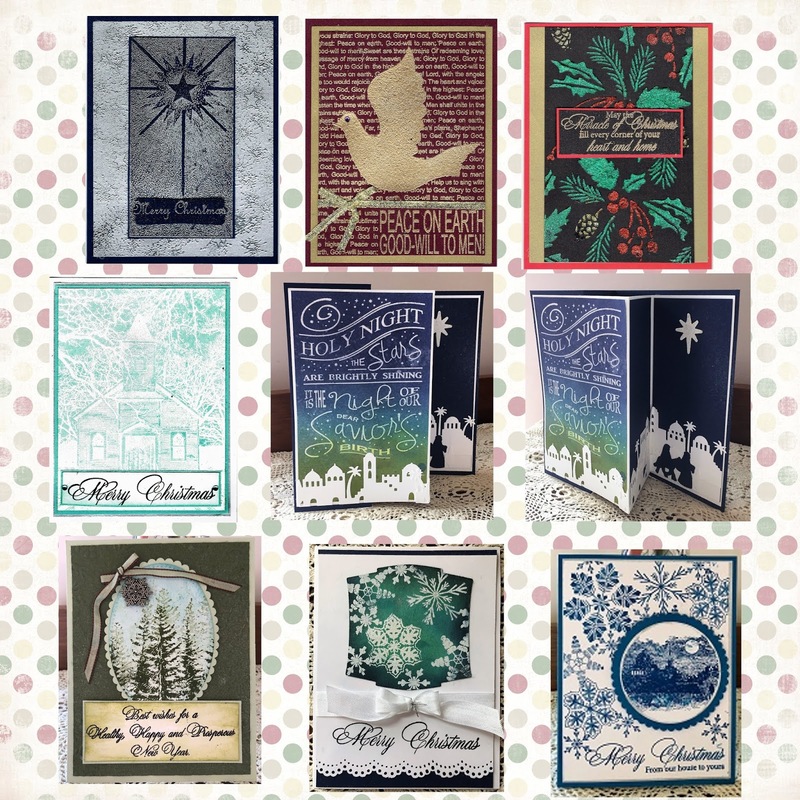 Since this is a very busy of the year, I know I am busy, and I am sure you are as well So I thought on this Monday Christmas Eve Day I would share with you nine of my personal favorite Christmas cards made with Technique Junkies Stamps. They have all been shared on my blog before. Please enjoy! And did you know there is a sale gong on on the Technique Junkies Stamps Web Store: Stamps for 25 cents? YUP! Technique Junkies is in the middle of inventory here at the Technique Junkies Web store, and we have way too many stamps in our warehouse -- and Pat Huntoon put a few hundred on sale! There are two categories: Cling Mounted, and Unmounted. Some stamps have never been on the website before! Many of the stamps are discounted well over 50%. Take a look! You could take home some good loot for a $10.00 bill! This sale is only good until these discounted stamps are going, going, gone!!! Remembering to use my discount code of TJ10Judy will save you 10% off of your total order. I hope you have a wonderfully Merry Christmas with your family. And just perhaps, you will get some "toys" and that you will have a chance to get just a wee bit inky! What is Christmas without CHOCOLATE? Never mind Christmas, what is LIFE without chocolate? Most of us love chocolate. I only know two people who do not like chocolate. This card celebrates chocolate! 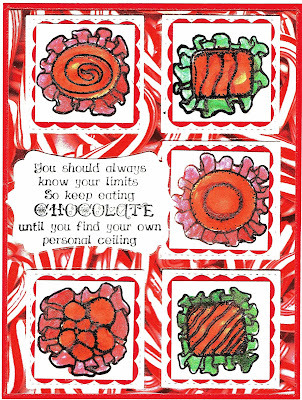 It features two Technique Junkies stamp sets: one is called Bon Bons, and the other is called Chocolate Sayings Set 5. And the verses are on sale! Stamps for 25 cents? YUP! Technique Junkies is in the middle of inventory here at the Technique Junkies Web store, and we have way too many stamps in our warehouse -- and Pat Huntoon put a few hundred on sale! There are two categories: Cling Mounted, and Unmounted. Some stamps have never been on the website before! Many of the stamps are discounted well over 50%. Take a look! You could take home some good loot for a $10.00 bill! I hope you have a wonderful day. I hope you are done shopping for Christmas. And I hope you have a chance to get inky! 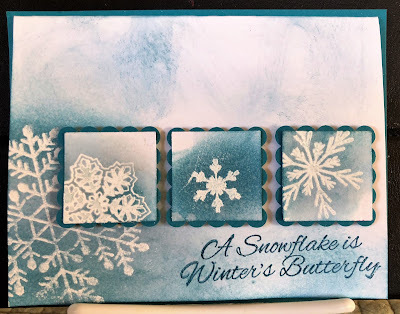 I used Technique Junkies Snowflakes stamp set. It is so pretty and so versatile! 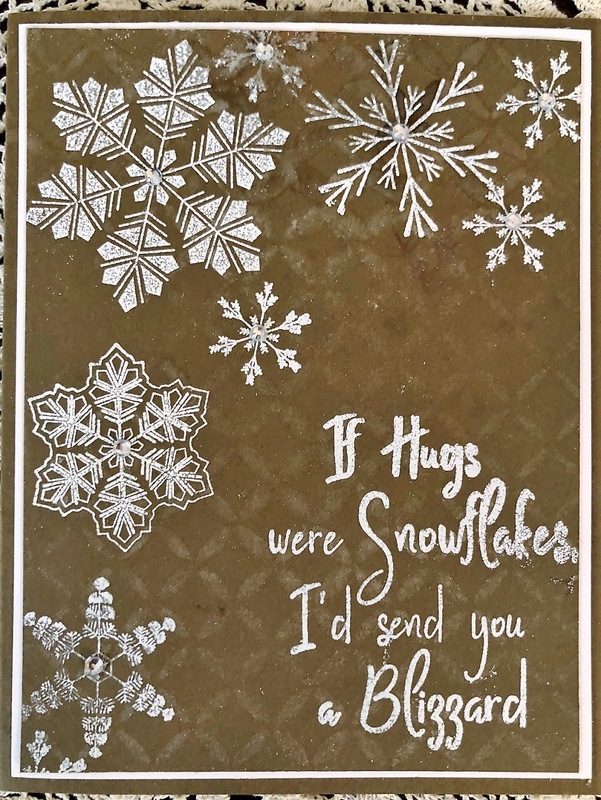 All of the snowflakes were heat embossed on white card stock. Then I sprayed Technique Junkies Mermaid Shimmering Bliss just enough to make the snowflakes stand out and show up. 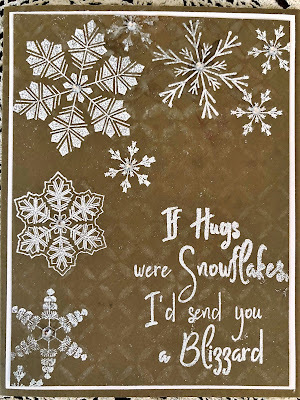 The inchie snow flakes were punched out and then layered with another punch out with a scalloped border. I sponged some color on the rest of the white card stock. Stamps for 25 cents? YUP! Technique Junkies is in the middle of inventory here at the Technique Junkies Web store, and we have way too many stamps in our warehouse -- and I put a few hundred on sale! There are two categories: Cling Mounted, and Unmounted. Some stamps have never been on the website before! Many of the stamps are discounted well over 50%. Take a look! You could take home some good loot for a $10.00 bill! Have a wonderful day -- is it snowing where you are? And get inky! 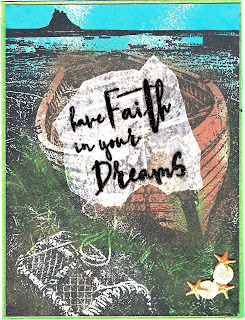 I used Technique Junkies Fishing Boat and Faith in Your Dreams to create this card. I used several colors of Shimmering Bliss Sprays and just spritzed over the grass, boat, and water. You could choose whichever sprays appealed to you! The verse is stamped and heat embossed on vellum and adhered using my Xyron machine. I added a brad of sand dollars and starfish. When you use the discount code TJ10Judy you can save 10% on your entire order. 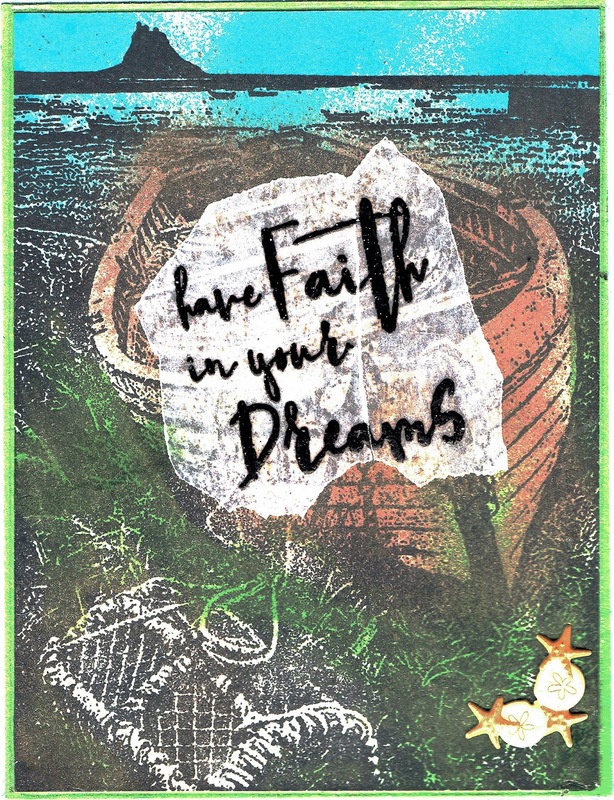 Have stamp-terrific day -- and get inky! I saw a sample card at a rubber stamp show. 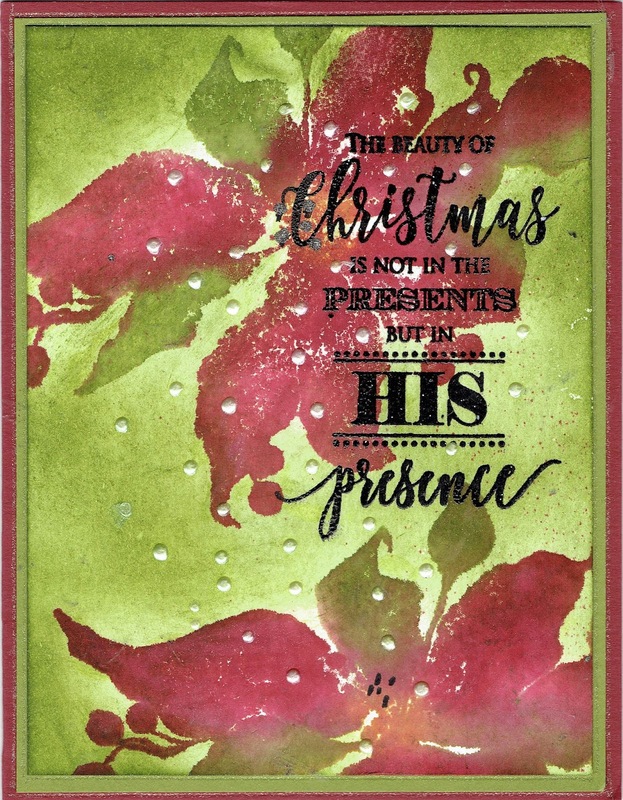 I loved this lovely poinsettia stamp. It is a Penny Black stamp called Scarlet Majesty and the verse is also Penny Black and is in a set called Rejoice with Joy. Sometimes when you see card on display at a stamp show you can see exactly how to make the card. I could not with this card, and I had to proceed with trial and error. I thought it was colored direct to stamp with markers but no, that did not turn out well. What worked well was to use finger daubers with ink from the the stamp pad directly on the stamp. Then I very lightly spritzed the stamp with a very fine mist of water and stamped it on white card stock. I repeated it a second time in the corner. I added the verse stamped with Versafine black ink and embossed with detail black embossing powder. I added small pearly dots with my Nuvo drops Ivory Seashell. Many vendors carry this product. I burnished the green background with my sponge and olive green ink. I misted over the top with Technique Junkies Dazzle Shimmering Bliss Topper. It is not a difficult card but it is a little time consuming but I feel it was worth the effort. Use my discount code TJ10Judy for ten percent off of your order of Technique Junkies products, including the Shimmering Bliss sprays. .
Have a great day getting inky! This is an unusual colored Christmas card. 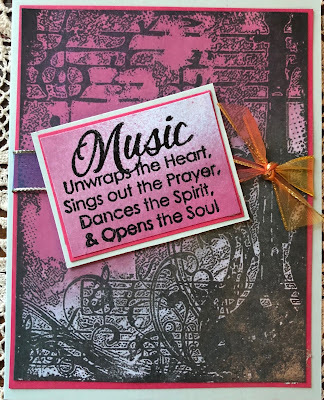 I used Technique Junkies Stamps Violin Collage and Music Opens the Soul. Shimmering Bliss Sprays Ocean Depth and Thulian Pink to color all parts of this card. My last piece of this rainbow ribbon to tie it all together. My verse on the inside also has music as a theme as I wish my friends a Merry Christmas. Using my discount code TJ10Judy saves you 10% on your total order. Have a marvelous day and take some time to get inky! 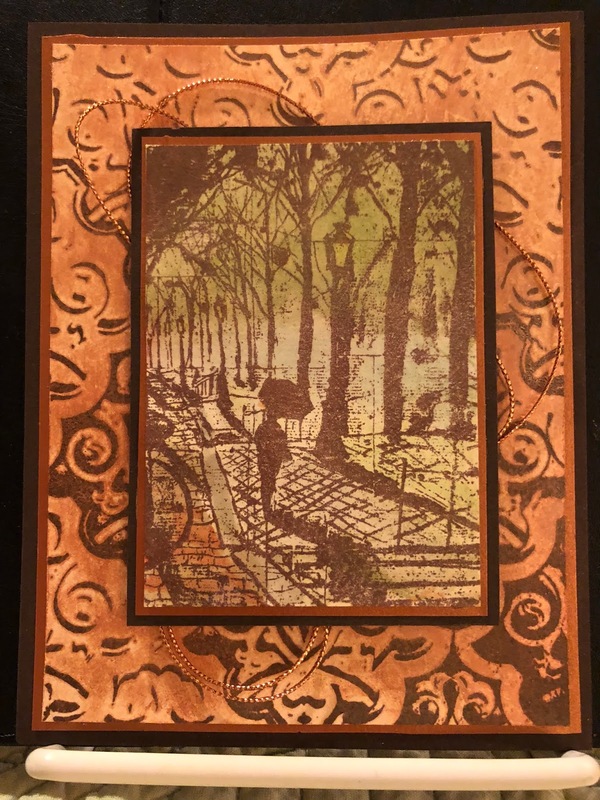 I used two lovely Technique Junkies Stamps Carved Relief and Park Walk. 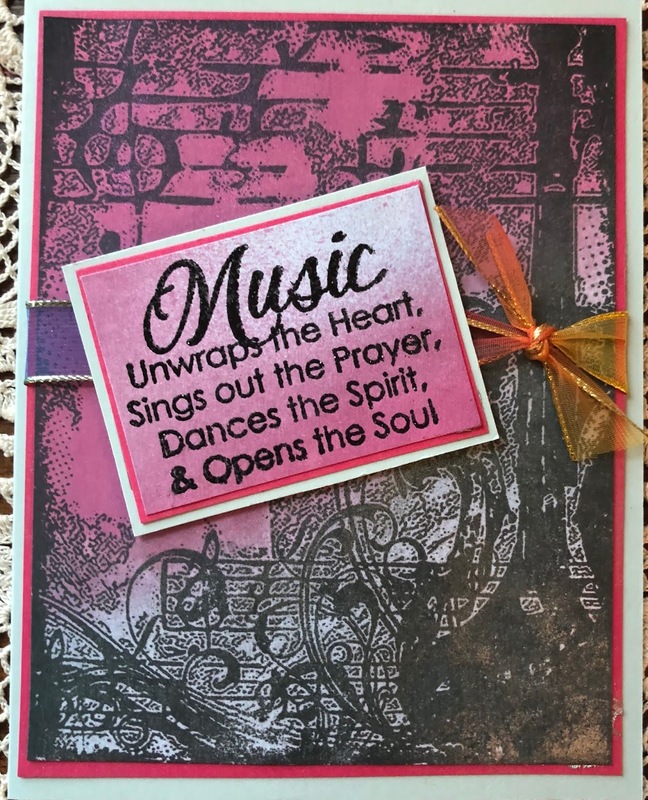 I stamped both images with a dark brown ink on white card stock. I sprayed the background with Simmering Bliss Harvest Sunset. I used Shimmering Bliss Harvest Sunset, Vivid Volt and Luscious Lawn. 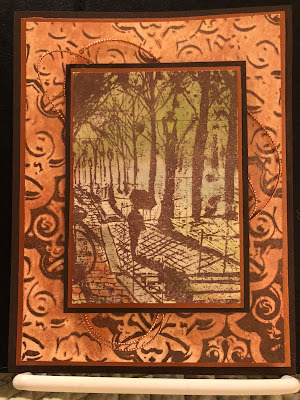 I used copper text weight paper and dark brown card stock as the layers for this card. Be sure to use my discount code TJ10Judy to save 10% of your own moolah when you place your order. We all like to save money. Have a great stamping being sure to get inky. 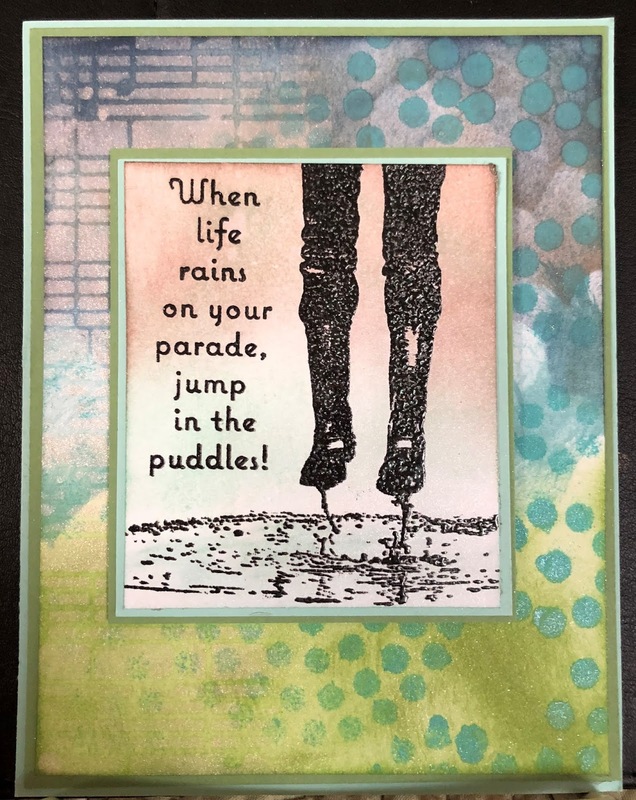 I used Technique Junkies stamp Puddle Jump to create this card. I used Technique Junkies Shimmering Bliss Sprays to create the background grass and sky. 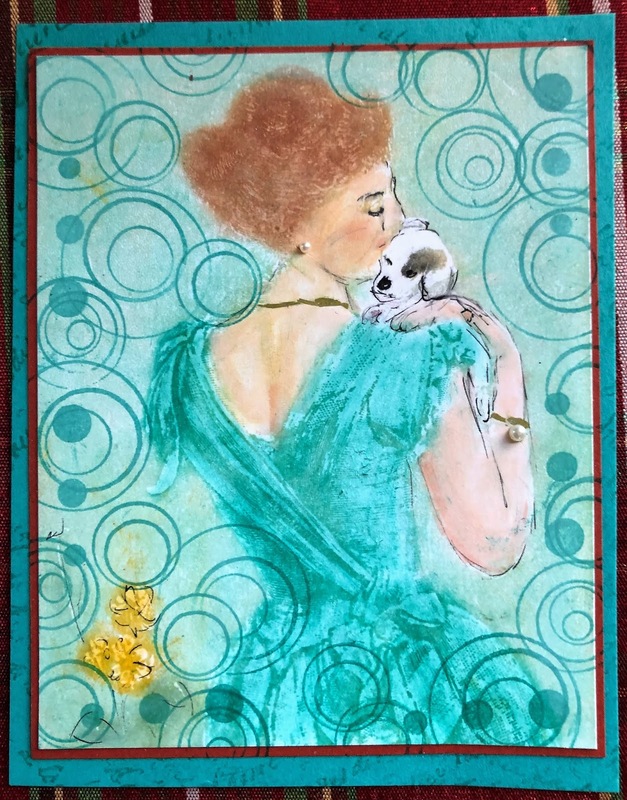 Then I used two different stencils (one was a Tim Holtz stencil) and A Colorful Life Stencil Circles Make Circles and I sprayed Shimmering Bliss through the stencils as well to add interest to the background. Remember to use my discount code TJ10Judy to save yourself 10% on your entire order. This is after Thanksgiving I know. This hymn stamp comes from Impression Obsession and is called Come Ye Faithful. The leaves are die cut and sprayed with a variety of colors of Technique Junkies Shimmering Bliss Sprays, as was the background. I die cut black leaves to add a shadow and help the top leaves to stand out. 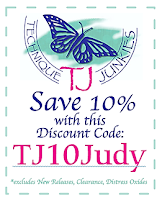 When you shop in the Technique Junkies web store be sure to use my discount code TJ10Judy to save 10% of your total order. Have a great day and get inky. The Snowflakes and the verse are all from Technique Junkies Snowflakes set. They are embossed with white embossing powder on tan card stock. Then I used A Colorful Life Stencil Medallion Fade. 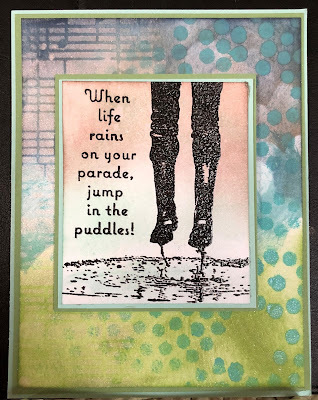 I sprayed Dazzle Shimmering Bliss Topper over the stencil to add interest to the background. Please remember to use my discount code TJ10Judy to get 10% off of your entire order. Have a good day and get inky!